The editor of deepseanews.com was kind enough to invite me to write a post for them. This post appears on their site at: http://deepseanews.com/2013/07/are-jellyfish-immortal/ and is reblogged here. A species of jelly, Turritopsis dohrnii, is able to cheat death, curling into a ball (signaling the end for most species), only to grow from its own shriveled remains into an immature juveniles once more. “ Escaping death and achieving potential immortality” writes the first scientists to describe this phenomenon , but is this just a neat trick, or can some species really live forever? This jelly is now known as the “immortal jelly”, and its infamy has grown with the years. But no one has published a report that this jelly can truly withstand the test of time; in fact, only one paper has been published suggesting some jelly relatives could live forever. Like many jelly species, members of the group Hydra have a polyp stage that reproduces asexually by budding off little clones, and people have speculated this could last for thousands of years. So Daniel E. Martínez closely watched members of one species, Hydra vulgaris, for 4 years, and in that time very few animals died . Dr. Martínez suggests that since animals that start reproducing only a few days after birth, such as Hydra, tend to kick the bucket earlier than animals that wait, 4 years is a pretty long time. But does that really mean they’re immortal? More information is needed about Hydra, but it’s not the only species people keep for decades, nor the only species that could help us understand if some jellies may last forever. So, to get to the bottom of this I polled the experts. I sent emails to some of the top jelly aquarists asking: do polyp clone populations change over time? Most public aquaria display jellyfish, and to do this they take advantage of the peculiar jelly life cycle. The life of jellies is broken into two parts: the polyp-type stage, which looks like Hydra and divides asexually, and the jelly stage, which grows from polyps and gets on with the busy act of sexual reproduction. To keep the number of exhibit jellies constant, aquarists use polyps as a literal clone bank, cueing them to produce more jellies as needed. And do these clone banks ever change or grow old? The answer was a unanimous “yeah, kinda.” According to aquarists at both the Monterey Bay Aquarium and the New England Aquarium, over about six years clonal populations do get “tired.” They become more fragile, don’t produce healthy jellies, and stop responding to environmental signals. Many aquarists replace their polyp stocks with new baby polyps quite regularly, so that none of this fickleness gets in the way of jelly production. The whole colony may continue to kick, but it gets more and more fragile over time. To me, this sounds a lot like aging. When humans die it’s not because a special gene turns on that shouts: “YOUR TIME IS UP!” Rather, little things start breaking all over, cells stop dividing and those that do accumulate mutations, this is why getting older is often accompanied by all sorts of biological issues. The truth is, accumulating mutations and cell gunk isn’t something special about aging people, even clone lines of E. coli bacteria accumulate harmful cellular products over time . This is just the cost of being alive. 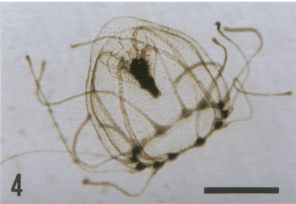 So does the “immortal jellyfish” Turritopsis dohrnii really last forever, even with all this gunk slowly working its way into its cells and genomes? I’m not convinced. Just because you can reverse your life cycle or clone yourself doesn’t mean you’ve got a get out of jail free card for all the consequences that come with being a living thing in the first place. You are still subject to that nasty gunk build up. Some species like Hydra vulvaris may have evolved ways to clean this gunk and beat the system, but the jury is still out on how, and for how long. While the “immortal” jellyfish Turritopsis dohrnii may be able to turn back its life cycle, it may not escape the inevitable slowing down that comes with age. In other words, while reversing your fate and escaping death for a short while may be a neat trick, it doesn’t guarantee immortality. Martínez DE (1998). Mortality patterns suggest lack of senescence in hydra. Exp Gerontol. vol 33 no 3 pp 217-25.